Would-be world conquerors Kaput and Zosky are at the pinnacle of their careers. So why does victory always slip from their grasp? On one planet the natives surrender to Kaput and Zosky without a fight – where's the fun in that? On another, Kaput finds that he's won the lottery – and the prize is invested by well-meaning people against his will until he learns he now rules their planet. He doesn't even have to shoot anyone first! Mayhem and hilarity abounds in these thirteen stories told with bright, cartoony art by Lewis Trondheim. The phenomenal Lewis Trondheim is never where you next expect him. As an artist and writer, Trondheim has earned an international following as one of the most inventive, versatile, and prolific graphic authors. From autobiography to adventure, from bestselling fantasy and children's books to visual essays, Trondheim's unique, seminal imagination consistently dazzles. His work has won numerous awards, including the Angoulême prize for best series with Mc Coney and he also co-created the titanic fantasy epic Dungeon with Joann Sfar. He is one of the founding members of the alternative publishing house L'Association, a proving ground for many of the greatest talents in European comics working today. He is also the editorial director of a new imprint called Shampooing, dedicated to comics for all ages. Lewis lives in the South of France with his wife and two children. “Kaput and Zosky are zany partners determined to rule the universe. The only problem is that something always goes wrong when they land on a planet. Humor is exhibited in the colorful drawings of the odd-looking characters (Kaput has an enormous overbit, a red Mohawk, and an egg-shaped body) within the small panels. The situations the team finds itself in and interchanges between the two are equally funny. When they visit Earth, they vow to "devour all their chocolate desserts," but the size of the earthlings, including their insects and litter, is too intimidating. The duo simply flees without putting up much of a fight. On another planet, they are mistaken for Cabbage Patch kits by a lonely couple. 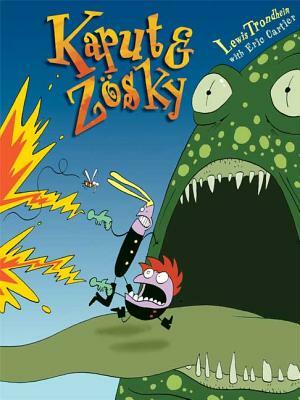 Between each of Kaput and Zosky's adventures, there is an even shorter strip featuring another character, Cosmonaut, a tiny man who also visits planets and often attacks various creatures.